Snow will begin on Thursday night, accumulate through the day on Friday, and then a period of intense snow will fall on Friday between about 1 pm - 8 pm which could cause temporary road closures with snowfall rates of 1-2 inches per hour. Snow will end late on Friday night, and storm totals by Saturday morning should be in the 6-12 inch range for most mountains, with some higher amounts not out of the question. Saturday will offer powder and a crisp, cold morning, but remember there is very limited terrain open right now. After that, we might see light snow next Tuesday and perhaps just after Thanksgiving. 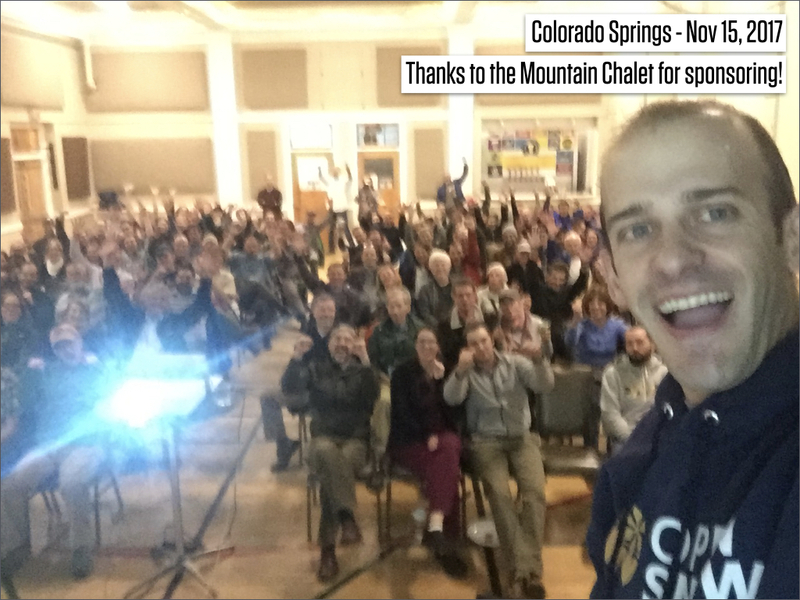 Thanks to the folks in Colorado Springs that came to my talk on Wednesday night, and thanks so much to the Mountain Chalet for sponsoring!!! If you're in the Denver area, I am giving another talk on Thursday night – see the announcements section below for more details. Everything is on track. Expect snow to begin late Thursday night and end late Friday night. Most mountains will measure storm totals in the 6-12 inch range. There is some upside potential due to the intense band of snow on Friday afternoon, so we might see higher totals. The best powder will be found on Friday in the central mountains and on Saturday morning at all mountains. This is the first part of the storm. It'll be rather warm with snow levels around 9,000 feet (lower during times of heavier snow). 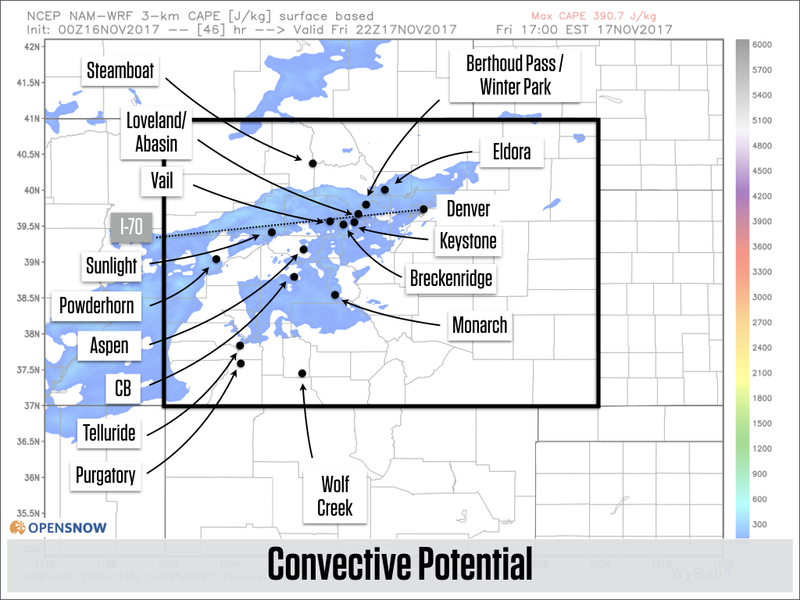 The wind direction during this time will be from the west-southwest, which is favorable for the central mountains (Crested Butte, Monarch, Snowmass) and can be somewhat favorable for the higher elevations of Summit County (Breckenridge, Keystone, Arapahoe Basin, Loveland). The southern mountains can also do well, especially around Wolf Creek. This is the second part of the storm. 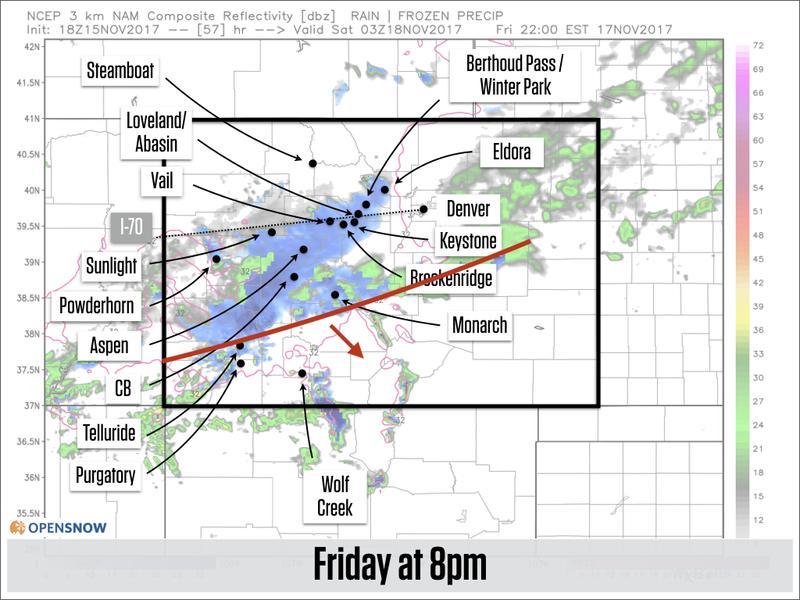 The main feature will be a cold front that moves from northwest-to-southeast across Colorado. As this cold front passes, expect intense snow with rates of 1-2 inches per hour, strong winds, and perhaps road closures due to accidents and low visibility. 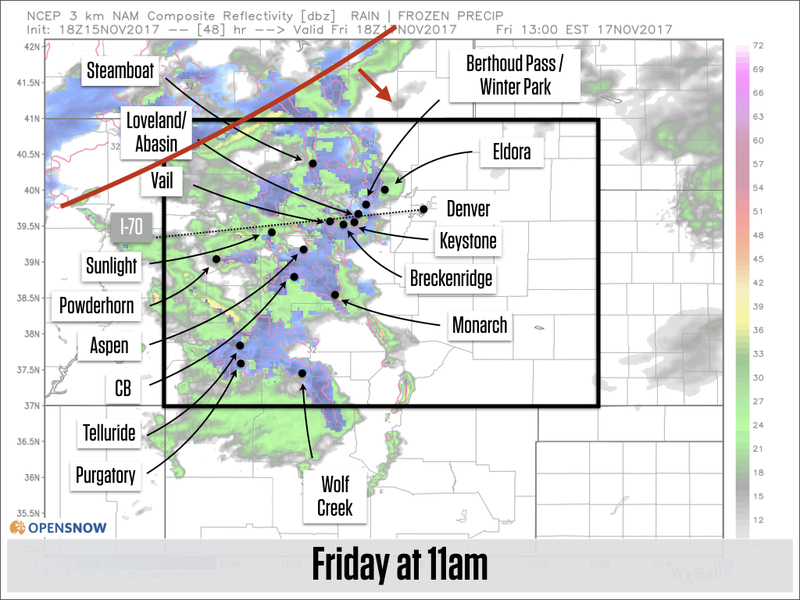 The forecast radar on Friday at 11 am. I marked the intense snow along the cold front with a red line. 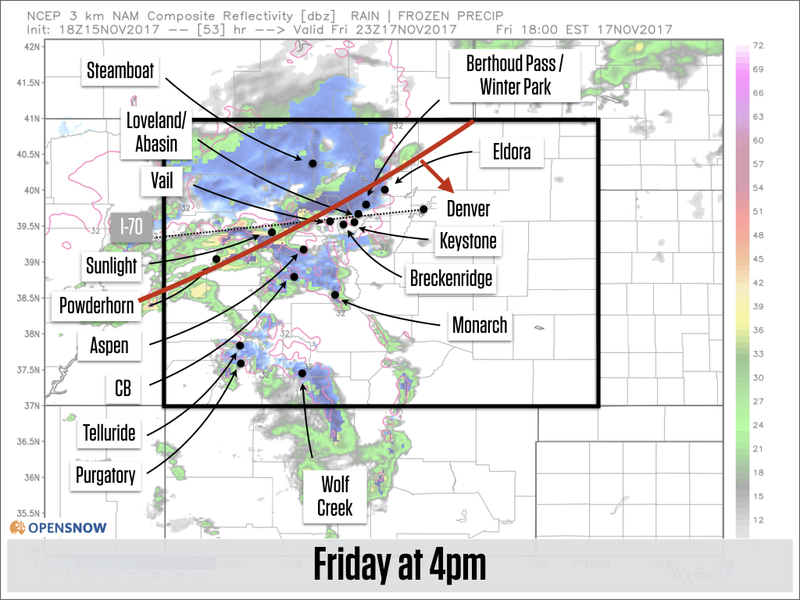 The forecast radar on Friday at 4 pm. The forecast radar on Friday at 8 pm. The forecast radar on Friday at 11 pm. I have a high amount of confidence in this intense snow not just because it is shown on the forecast radar. To have high confidence, I like to understand WHY the model is showing something, and in this case, there are three things we can verify. First, the model shows that there is convective potential. This is one of the ingredients in a thunderstorm. Essentially, the higher the convective potential, the greater the chance for fast-moving rising air and thus heavy precipitation. Second, the model shows a cold front. Cold fronts help to lift air as the cold air behind the front moves along like a wedge, forcing the air ahead of the front to rise. Rising air helps to create precipitation. The image below shows the colder air in the upper left, and the cold air is moving to the lower right. Third and finally, the Jet Stream will be over Colorado. The Jet Stream is an area of fast wind speeds around 30,000 feet, and this fast wind speed far overhead helps to pull air up from the ground (like the fast wind outside of a moving car can pull paper and wrappers from the vehicle). 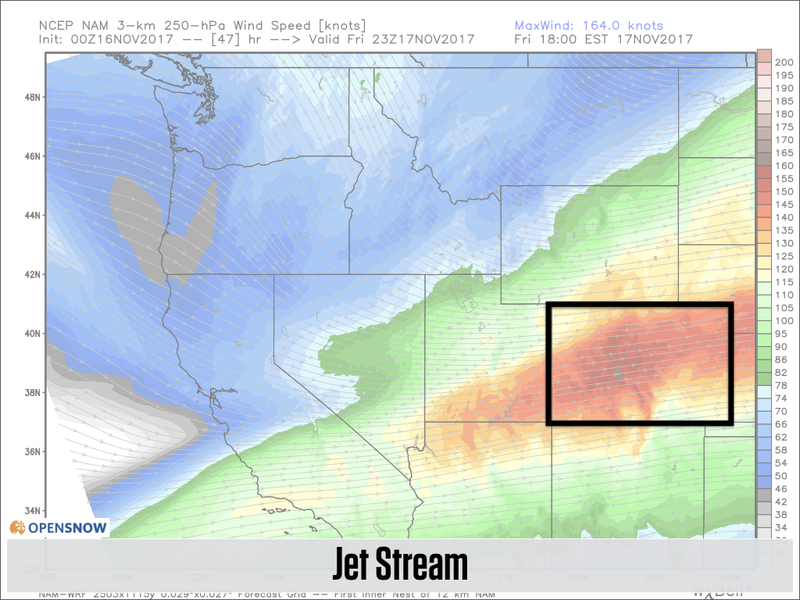 The combination of the convective potential, cold front, and Jet Stream can create a narrow band of intense precipitation. Since these three puzzle pieces agree with the model's forecast radar, it leads to high confidence in the forecast. Don't be surprised if and when roads close on Friday afternoon. Just sayin'. 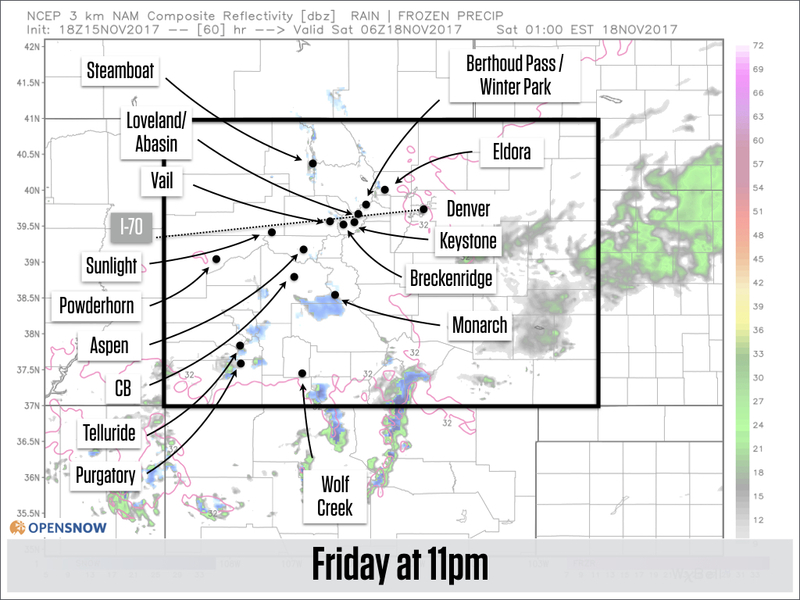 After the cold front, we should see a few more hours of snow on Friday night, favoring areas that do best with northwest winds, including Vail, Aspen, Copper, Summit County, and over to Winter Park and Berthoud Pass. You can see this lingering area of snow on the forecast radar map at 8 pm (above). It'll be a proper winter morning. Fresh snow. Cold temperatures (single digits and teens). Clearing blue skies. Light winds, except stronger winds along and just east of the divide from Berthoud Pass north to Cameron Pass. There is not a lot of inbounds open terrain. Make the most of what's available. If this were mid-winter, I would expect great powder on Saturday morning. But with limited terrain, a lot of Friday night's snow might get groomed. The backcountry could be fun where there is a deep enough base, but remember, if there is enough snow to ride, there is enough to slide. 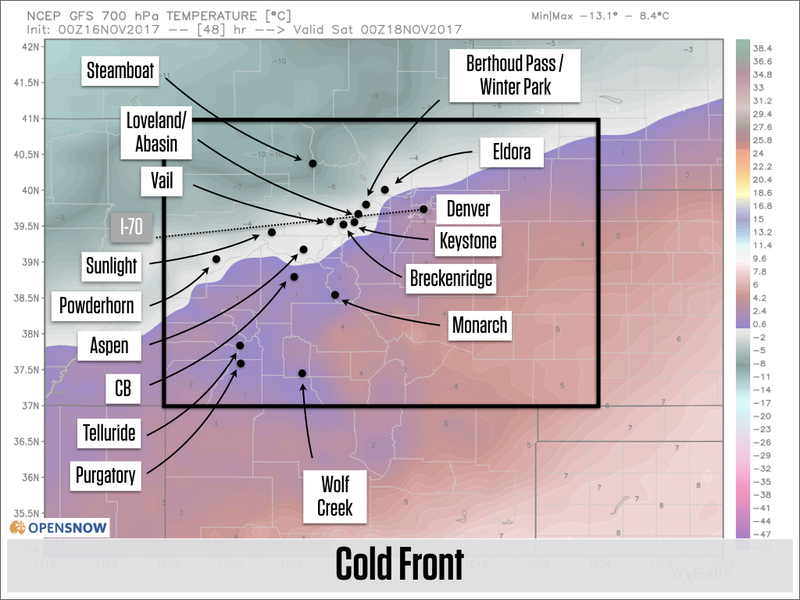 Check the Colorado Avalanche Information Center forecasts as they are the pros when it comes to avalanche risk and knowledge. This weekend should be dry, then we might see light snow around Tuesday, November 21 and again perhaps around Friday, November 24. The weather pattern during Thanksgiving week and the week after Thanksgiving is not favorable for us to see a lot of snow in Colorado. However, just one week ago, most models did not show the significant storm that we're going to get this week on Friday. So, a lot can change in the forecast over the next 7-10 days. I am not saying this to be unreasonably optimistic, but because we just saw it happen over the last 7-10 days. I still believe that we'll see a change toward cooler and snowier weather late in November or sometime during the first half of December. Some models are hinting at this, but it's too soon to know any details. Lastly, thanks for indulging me because this is the third day in a row that I am going to mention the individual mountain Daily Snows. If you've read this before, sorry, and please skip it! Thanks for reading this Colorado Daily Snow, and I hope to see many of you at my talk in Denver ... see below for details!